On Friday the 13th, a friend I was hanging out with suddenly went, "Oh, hey, there's this Witches' Night Out market tonight. Wanna go?" Well, sure! And I saw some really really lovely things. Tempered Toad had an adorable baby mandrake pendant and a gorgeous wirework Luna moth necklace, and I was able to point her at someplace to find live mandrake plants. 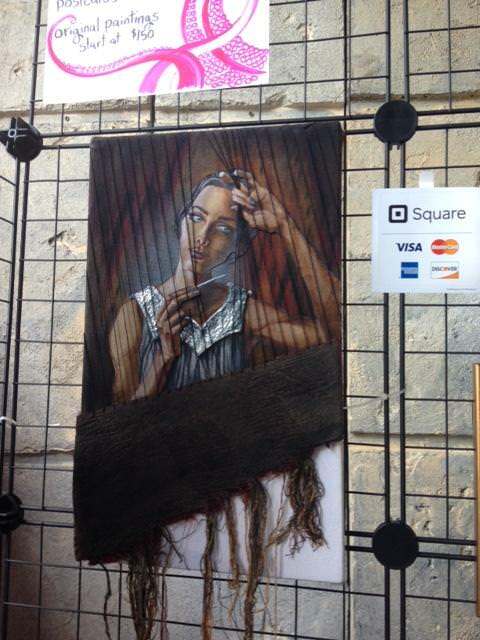 Julia Y had an incredible Athena Ergane mixed media piece (image above) that sold about five minutes after I saw it. I'm hoping to work with her on doing custom weaving for more pieces similar to it. And Lois Gaylord of Weaving Oneness not only had lovely work, she gave a 15-minute talk on the Magic of Cloth that was wonderful! She discussed several interesting techniques, including using a spinning wheel to maintain balance for a Samhain ritual that tended to have a vortex, spinning creative energies together to make things, using dyes and paints to create cloth for special purposes, and, most impressively, a technique for unraveling one thing and transforming it into another. She does it by taking burlap, painting the name of what she wants to take apart on it, unravelling it, shredding the yarn on wool cards, carding it in with other fiber, and spinning and weaving it into something new. She talked about unravelling family resistance for a friend and reweaving support, and the friend having her brother turn around and side with her the next day. It's clearly a very powerful technique, and one which I look forward to trying. I spoke briefly with her about my technique for weaving wards, and she seemed to like the idea. Always nice to get some affirmation from someone who works in the same kinds of ways.